German authoress and communal worker; born in Breslau Nov. 25, 1830. The Revolution of 1848 led her to interest herself in the political and social situation. 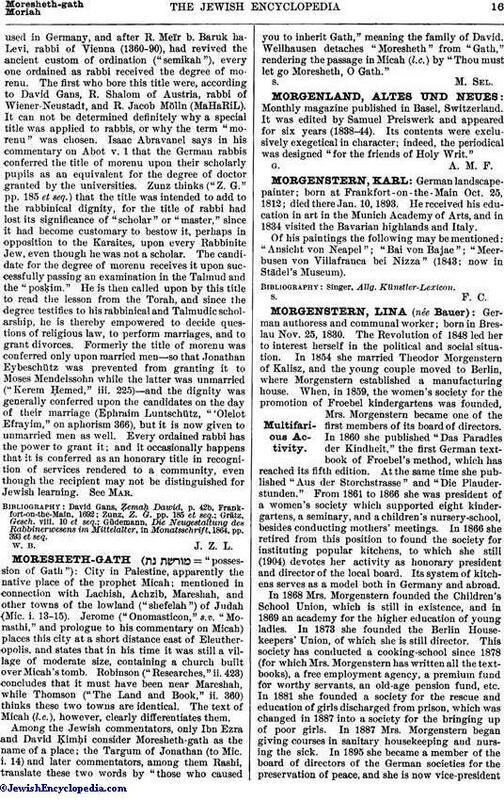 In 1854 she married Theodor Morgenstern of Kalisz, and the young couple moved to Berlin, where Morgenstern established a manufacturing house. When, in 1859, the women's society for the promotion of Froebel kindergartens was founded, Mrs. Morgenstern became one of the first members of its board of directors. In 1860 she published "Das Paradies der Kindheit," the first German text-book of Froebel's method, which has reached its fifth edition. At the same time she published "Aus der Storchstrasse" and "Die Plauderstunden." From 1861 to 1866 she was president of a women's society which supported eight kindergartens, a seminary, and a children's nursery-school, besides conducting mothers' meetings. In 1866 she retired from this position to found the society for instituting popular kitchens, to which she still (1904) devotes her activity as honorary president and director of the local board. Its system of kitchens serves as a model both in Germany and abroad. In 1868 Mrs. Morgenstern founded the Children's School Union, which is still in existence, and in 1869 an academy for the higher education of young ladies. In 1873 she founded the Berlin House-keepers' Union, of which she is still director. This society has conducted a cooking-school since 1878 (for which Mrs. Morgenstern has written all the text-books), a free employment agency, a premium fund for worthy servants, an old-age pension fund, etc. In 1881 she founded a society for the rescue and education of girls discharged from prison, which was changed in 1887 into a society for the bringing up of poor girls. In 1887 Mrs. Morgenstern began giving courses in sanitary housekeeping and nursing the sick. In 1895 she became a member of the board of directors of the German societies for the preservation of peace, and she is now vice-presidentof the Alliance des Femmes pour la Paix. In 1896 she convened the first international woman's congress at Berlin, at which 1,800 delegates were present from all parts of the world. 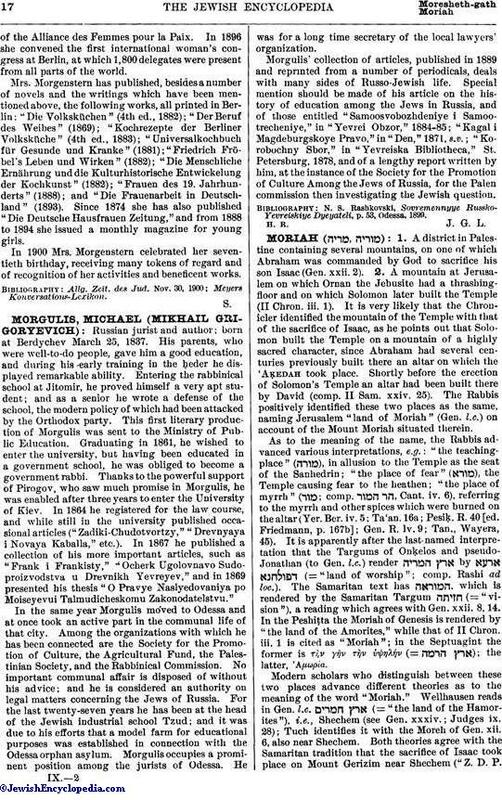 Mrs. Morgenstern has published, besides a number of novels and the writings which have been mentioned above, the following works, all printed in Berlin: "Die Volksküchen" (4th ed., 1882); "Der Beruf des Weibes" (1869); "Kochrezepte der Berliner Volksküche" (4th ed., 1883); "Universalkochbuch für Gesunde und Kranke" (1881); "Friedrich Fröbel's Leben und Wirken" (1882); "Die Menschliche Ernährung und die Kulturhistorische Entwickelung der Kochkunst" (1882); "Frauen des 19. Jahrhunderts" (1888); and "Die Frauenarbeit in Deutschland" (1893). Since 1874 she has also published "Die Deutsche Hausfrauen Zeitung," and from 1888 to 1894 she issued a monthly magazine for young girls. In 1900 Mrs. Morgenstern celebrated her seventieth birthday, receiving many tokens of regard and of recognition of her activities and beneficent works.